If riding your bike is making you smile then this bicycle t-shirt is just what you need. 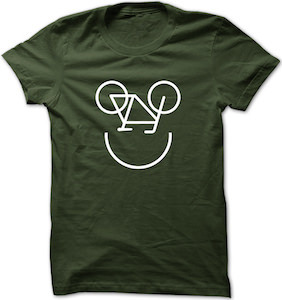 This t-shirt comes in many fun colors and all show an upside down bicycle with a half circle below it and if you look a bit closer then all that looks like a fun smiley face and that of course is what you get when you ride your bike around. You can get this t-shirt in many sizes and styles for men and women so that you can show the world how much you like riding you bicycle and what it does to you. Let the sunshine in and pass out free smiles with this one of a kind t-shirt. It will look great with your blue jeans, skirt or yoga pants. There are two separate images on this white t-shirt. The first is across the chest and says, “Smile” with a small smiley face and a heart. It is all in pink. The second image is a small girl who is holding the string to a pink smiley face yo-yo. It also says, “Happy Smile”. This t-shirt comes in a one size fits XS and is made of cotton. 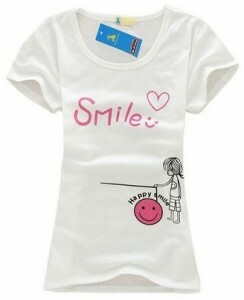 Make someone happy today with the Little Girl Happy Smile T-Shirt. We all know it to smile when taking a photo but still we keep saying it. Now those days can be a thing from the past simply by wearing this smile t-shirt. 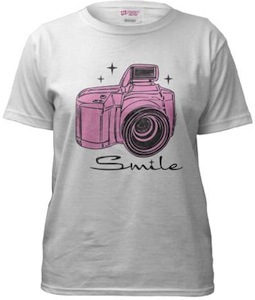 This t-shirt shows a nice pink camera and the word smile below it. And this camera smile t-shirt comes in different styles for men, women and kids. So if you take a lot of photo’s of people then this t-shirt is just what you need.